Gen. Douglas MacArthur standing with a group of Allied American and Australian leaders in front of his B-17E “Bataan” 41-2593 parked at Garbutt Field at Townsville, Queensland, Australia circa 1942. Left to right: Hon. 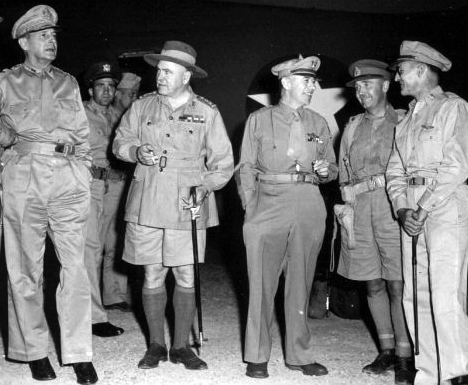 F. M. Forde, Minister of the Army, Gen. MacArthur, General Sir Thomas Blamey, Maj. Gen. George Kenney, 5th Air Force Commander, Maj. Gen. C. A. Clowes, Brig. Gen. Kenneth Walker, Commander, 5th Bomber Command.